Story Club Cleveland is a charitable open mic for stories, and is one of the many Story Club shows (Chicago, Boston, Minneapolis, Columbus). ​We’re held twice a month – 1st Tuesdays at The BottleHouse Brewing Company and 2nd Wednesdays at Forest City Brewery. 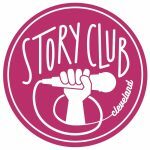 Story Club: "Going the Distance"